COLOR CHAMP, 3xRC & JC Fleece,9.2#Shear! 8x 1st, 7x Color Champ & 2x JUDGES CHOICE! Thank you for visiting our website as we enjoy our 13th year of participation in the alpaca industry through quality fleece production, alpaca sales, herdsire breedings and alpaca products. 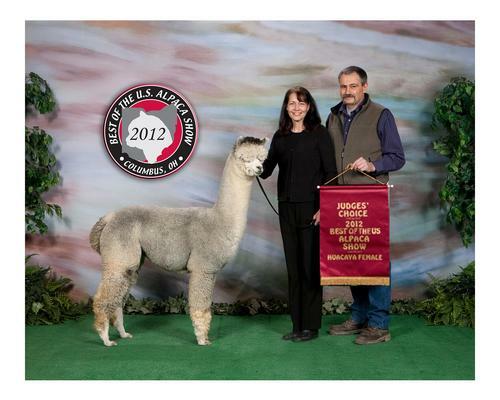 If you are interested in outstanding breedings, beautiful alpacas for sale, or our luscious home grown yarn, please consider Morning SKY Farm; Color Champions, Reserve Champions and Judges' Choice alpacas in halter and fleece - with the science to back it up - live here! Our breeding program? 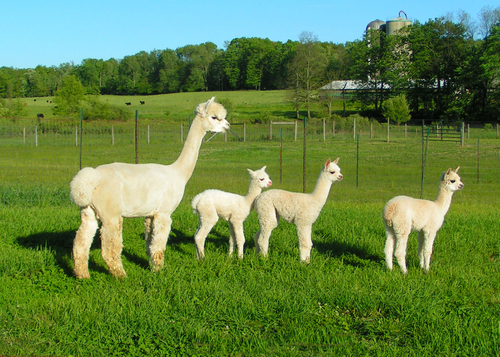 Our alpacas are mostly Peruvian - in both white and color - infused with Accoyo bloodlines. 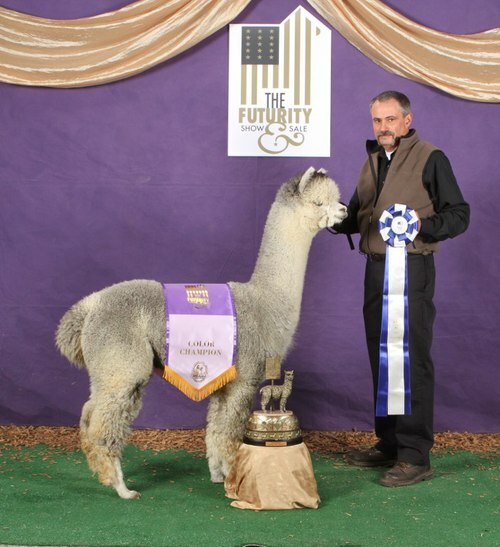 Our focus is on a carefully crafted breeding program where every generation improves upon the last and brings out positive traits in fleece, conformation and temperament. 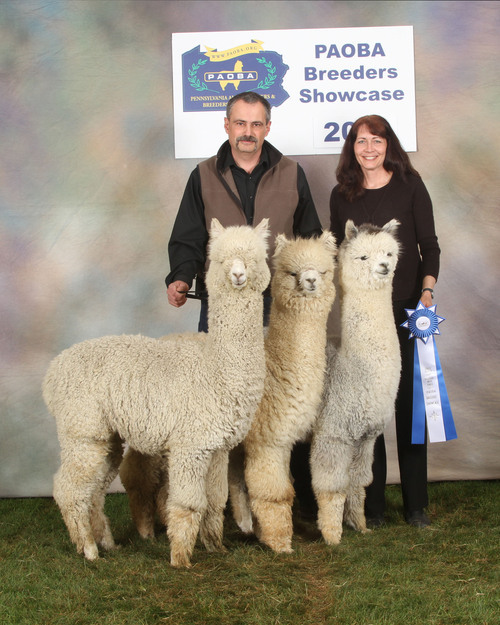 We work hard to excel in all areas of alpaca ownership, with show quality breeding stock and fleece, beautiful yarn, educational opportunities, and customer service, and we have given back to the industry through volunteerism. We are hands-on owners who can also be called on for customer support, since the health of our alpacas (and of those who are purchased from us) are of the ultimate importance to us - just some of the benefits of dealing with a smaller farm who is dedicated to the progress of this industry! We hope to have our products online soon, so please check back! We also have many alpacas for sale who are not listed, so please get in touch if you would like to set up an appointment to see all of our available alpacas for sale. Welcome to the virtual version of Morning SKY Farm (named for the beautifully colored and ever changing SKY that is the backdrop for our gorgeous alpacas each morning!) Our site is just a sampling our outstanding alpacas and luscious yarn and products. Only 2 miles west of interstate 79 in northwestern PA (between Pittsburgh and Erie,) give us a call if you are interested in alpaca ownership! Owning alpacas is both a pleasure and a passion as we try constantly strive to maintain and advance the positive fiber and conformation qualities of our award-winning herd in order to produce the exquisite fiber, then yarn that they will produce. If you are interested in multiple breeding discounts for our champion herdsires, our lovely alpacas for sale (including many more than are listed) or our gorgeous home grown yarn, we'll look forward to hearing from you. Like us on Facebook or e-mail us with questions or to be added to our e-mail list for farm events or product updates.